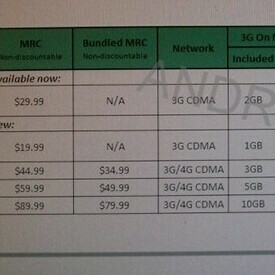 The folks at Android Police got their hands on a document detailing the new additions to Sprint's tablet plans. Sprint currently offers 1GB, 2GB, 3GB, and 5GB plans for $19.99, $29.99, $44.99, and $59.99 respectively. But along with the introduction of the HTC EVO View 4G, Sprint is rolling out a new 10GB plan for $90/month. In addition to this data-hungry option, customers with a 3GB plan or higher will have unlimited access to Sprint's WiMAX 4G. Hold onto your seats. If you already own a Sprint smartphone with an unlimited plan, you also get $10 off your tablet plan when you bundle them together. Sprint recently talked about diversifying their tablet plan options, but we don't think this is what they meant. We expect them to start offering even more flexible plans that will let you purchase by the day, week, or month as well.